We’re lucky enough to live under The South Downs. Just above us is Bepton Down – a Site of Special Scientific Interest (an SSSI) and home to huge range of species from unusual snails to rare orchids. By this time of the year it’s normally jam packed with lovely wild flowers (see our photos from previous years below) but it’s not been doing so well in 2015 because the land isn’t being managed properly. A local lady, Beatrice Potter has identified six species of wild orchid including the Greater Butterfly Orchid, Bee Orchid, Common Spotted Orchid, Early Purple Orchid, Pyramidal Orchid and the Common Twayblade. Here are some photos of what we’ve seen over the last few years! Stunning aren’t they? In 2014 concerns over the management of the Site were expressed by parishioners at the Annual Parish Assembly and a Management Plan was put in place by Natural England, the South Downs National Park and the landowner, the Cowdray Estate. The site was becoming overrun by brambles and hawthorn, and a plan to sort things out for the sake of the orchids was put in place. RIGHT THEN here’s my bit of environmental campaigning! The brambles were supposed to be ‘topped’ during the winter to allow frost to get into them – this didn’t happen. Part of the management of the land included grazing by sheep during the winter – the sheep should have gone before the growing season but they were left grazing the orchids and cowslips for a whole month longer than they should have been. Come on folks! This is NOT the right way to manage an SSSI. I walked over Bepton Down at the weekend and there are no orchids to be seen. There are plenty growing in the woods and in the verges but our SSSI is definitely behind the rest of the local area. I will keep an eye on Bepton Down for the next 30 days to see if the orchids recover. 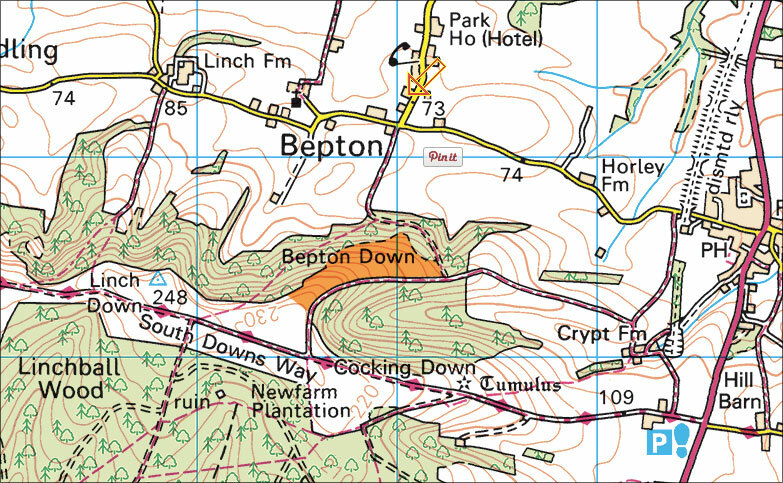 Here’s a map of where to find Bepton Down – drop me a message to let me know what you find, and if you have concerns send a message to The Parish Council.